This was my first time representing the HMA at the European Central Council of Homeopaths. I felt warmly welcomed and accepted by the whole group. The atmosphere was one of cordiality, warmth and a general willingness to work together for the good of all involved in homeopathy. I arrived in Sofia on Tuesday afternoon, having left home at 2am that morning. 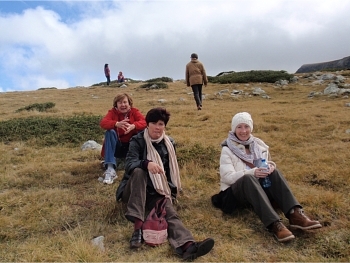 On the Wednesday morning everyone gathered together at 8.30 for a walk in the mountains, organised by Lilia, one of the Bulgarian Homeopaths. 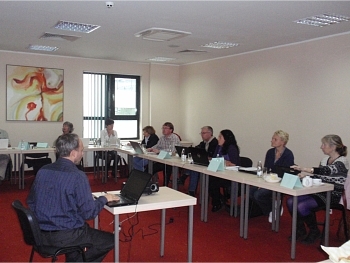 The situation is, that it is illegal to practice Homeopathy in Bulgaria unless you are a Medical Doctor. Despite this legislation it would appear that many successful homeopaths are in practice and teaching homeopathy against the odds. The ECCH would like to help to raise awareness of the situation in Bulgaria and would encourage people to write to the Bulgarian Medical Association to highlight the problem and to point out that throughout the rest of Europe it is legal to practice without being part of the medical profession. The walk in the mountains was wonderful, the weather was good, dry, sunny and not too cold, although a little misty. At the beginning was a ski lift which was good fun and perhaps a little bit scary ! It was swinging about rather too much for my comfort zone. My ski lift partner and I had to reassure each other that we were perfectly safe all the way up the mountain, which seemed to go on for ever. Legs shaking, we jumped out and almost fell over as the lift just carries on. We had a three hour walk which was beautiful and exhilarating, at the top of which was a stunning lake. At the end of the walk we got to a mountainside café, where hot soup was enjoyed by all. The next four days were spent in a very productive and positive meeting. Items that came out of the meeting were finalisation of plans for the Media Symposium in 2011, which will be arranged back to back with the ECCH AGM so that travel and other expenses are kept to a minimum. This event will be held in Leuven’s Belgium. This Symposium will be very interesting and innovative and during this current climate extremely useful for all homeopaths. I would strongly recommend that all of our members seriously consider attending. It will be a valuable experience and will provide rich CPD. One of the ideas to come out of the meeting was to raise the media profile of the ECCH by starting up a Facebook and Twitter account and these will, (by the time you read this) be up and running. An Education symposium is planned for 2012 and this will be another valuable event. Much work was achieved during the four days including working finding a simple statement to describe homeopathy/ homeopaths, just one sentence. We worked on this in smaller groups and I was part of the working group looking at education and the Education guidelines. Overall I was impressed at how positive the meeting was and how so many different homeopaths from different countries can come together around the table and all get on so well together. Working together, for the common goal of the future of Homeopathy. Well-established, therapy Centre, London, NW2 looking for a Homeopath. The Centre offers great opportunities for successful practices. Interesting/informative talks on Homeopathy and other complementary health related topics are held on the second Tuesday of the month (not Aug or Dec) at 7.30pm in the Canford Room at the Allendale Centre, Wimborne, Dorset (adjacent car park) Membership £12 also includes quarterly newsletters. Entry £3 for non-members who are always very welcome and we can provide a certificate of attendance for CPD, given an advance request.